we do it on our free time! 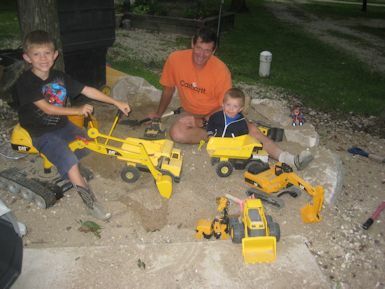 Darren has been passionate about moving dirt his entire life. He was driving tractor and baling hay at the age of nine. He was so passionate about it, in fact, that he founded a non-profit ministry to serve the excavating and landscaping needs of Christian ministries and has worked in a missionary capacity doing that since 2004. That ministry work took Darren and family to communities around the country from Oregon to Texas to Minnesota and back again. Working on a wide variety of properties and projects and learning they way they do stuff in other parts of the country brings leading-edge information, technology, and building practices to your residential, farm, or small commercial project. Do you remember what mamma said? "Son, leave the place better than when you found it!" The Standard at Impact Excavating is to do our best professional work at the most affordable price and ALWAYS repair the landscape before we say the job is done.